D-Link’s new business class router. D-LINK has added a new VPN Router (DI-804V) to its line up of broadband based products. The DI-804V is a high-performance broadband internet gateway router with secure data transmission designed for branch office communication. Cost-effectively linking a small office to the outside world through the Internet, the DI-804V offers an alternative to the cost-prohibitive point-to-point dedicated connectivity of leased lines. This business-class router provides IPSec security for Virtual Private Network applications, enabling branch networks to be extended to remote networks, such as the corporate office or a trusted supplier, to act as if the two were a single LAN. 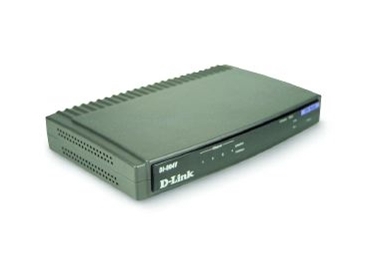 In addition, the DI-804V also provides cost-saving Internet functions to enable sharing of a single cable/DSL modem and ISP account among office users, while providing them with physical connections through the built-in LAN switch ports. The DI-804V prevents confidential data being accessed and tampered with when traveling along the public Internet to a destination. Through VPN tunneling protocols, the DI-804V privatises communication channels. Mail and data can be safely exchanged with head office over the Internet, without fear of observation, modification, or spoofing. With support for up to 8 IPSec tunnels, the DI-804V can provide flexible VPN implementation for data confidentiality, integrity and origin authentication to remote sites. Supported data encapsulation, encryption and authentication options include IP ESP, DES, 3DES, MD5 and SHA-1. The DI-804V is equipped with a powerful 32-bit RISC CPU and large RAM to perform its intensive security tasks. This allows the router to run without data throughput degradation while supporting DES/3DES encryption and other security features.